National Institute of Certified College Planners "How to Bridge College Planning to Retirement Planning"
M&O Marketing "How to Read a Tax Return and Uncover More Opportunities for Business"
State Farm "Marketing Financial Services to Seniors and Baby Boomers"
CUNA Mutual Brokerage (Sponsored by SunLife Distributors) "How to Be a Million Dollar Producer in the IRA Rollover Market"
Ann Arbor Annuity Exchange "How to Be a Million Dollar Earner"
NAIFA California Annual Conference "How to Become a Million Dollar Producer "
John Hancock Annuities "How to Be a Million Dollar Producer in the IRA Rollover Market"
Dozens of associations and large companies have invited a financial keynote speaker to address their meetings. 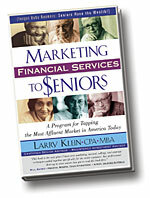 Larry Klein, CPA (inactive) Harvard MBA has spoken at dozens of financial conferences on his book, Marketing Financial Services to Seniors, on marketing financial products and services, using direct mail, advertising, and how any financial advisor can be a marketing machine and never lack clients. Also in demand are the concepts he covers in his book How to be a Million Dollar Producer. The impact to your organization is substantial when each individual begins to use Klein's methods to increase their revenue. Do you want just a motivational speaker who will make a great impression, speak in generalities and have people feel good for 30 minutes? Then don't hire Klein as your public speaker! When he speaks, the audience is not only entertained and energized, they walk away with tactical items to implement on Monday morning for an immediate increase in results. He gets barraged with questions, as the audience wants more even when his time is up. 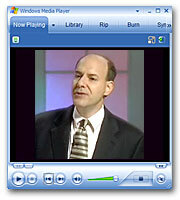 He's a professional speaker with only one goal—to get results for the audience. As a result, he is listed and retained by several speaker bureaus. Over 20,000 financial professionals use his marketing systems and there's a reason—he's a top notch marketer with an uncommon message that makes the difference. 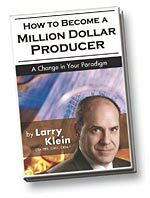 At your next financial services conference, don't settle for just an entertainerget mileage and profit for your producers by selecting Larry Klein as your next conference keynote speaker. Have one of the nation's leading authorities on marketing financial services as your next conference speaker at an annual meeting or association event.